Prime Minister Narendra Modi on Saturday pressed for United Nation Security Council reform within a “fixed timeframe” in the current session of the United Nations General Assembly, saying the world body reflects the mindset of a century “we left behind” and is not in tune with new concerns like terrorism and climate change. Hosting a summit of leaders of Germany, Japan and Brazil under the G-4 format, he said the UNSC “must include the world’s largest democracies, major locomotives of the global economy, and voices from all the major continents” to carry “greater credibility and legitimacy”. It will make it more representative and effective in addressing the challenges of the 21st century, he said at the summit meeting with Germany Chancellor Angela Merkel, Japanese Prime Minister Shinzo Abe and Brazilian President Dilma Rousseff, the first since 2004. Modi noted that “some movement” had been witnessed recently in the decades-old endeavour when the UNGA took the “significant step” to commence text-based negotiations on the reforms but said it has to be taken to its logical conclusion during the current 70th session of the global body. “Our institutions, approaches, and often mindsets, reflect the wisdom of the century we have left behind, not the century we live in. This is especially true of the United Nations Security Council,” the prime minister said. “The reform of the Security Council within a fixed time frame has become an urgent and important task,” he said, while talking about the modern age challenges like trends in demography, urbanization and migrations. “Climate change and terrorism are new concerns. Cyber and space are entirely new frontiers of opportunities and challenges, he said. G-4 is a grouping which has been jointly pushing for reform of the UN Security Council to make it broad-based by including them as permanent members. Leaders of the 11-year-old grouping, which has been jointly pushing for UNSC reform and their entry into it as permanent members, “expressed determination to redouble their efforts towards securing concrete outcomes during the 70th session of the General Assembly”. The four nations pledged to work together with all member states and to accelerate outreach towards achieving an “early and meaningful reform” of the UNSC, the joint statement said. They supported Africa’s representation in both the permanent and non-permanent membership in the UNSC, while noting the importance of adequate and continuing representation of small and medium sized member states, including the small island developing states, in an expanded and reformed Council. They also affirmed their resolve to continue contributing to the fulfilment of the purposes and principles of the UN Charter, it said. “The reform of the Security Council within a fixed time frame has become an urgent and important task,” Modi said. Modi, while making initial remarks, said the subject of reforms in the UNSC has been the focus of global attention for decades but “unfortunately, without progress” so far. “We live in a fundamentally different world from the time the UN was born. The number of member states has grown four-fold. 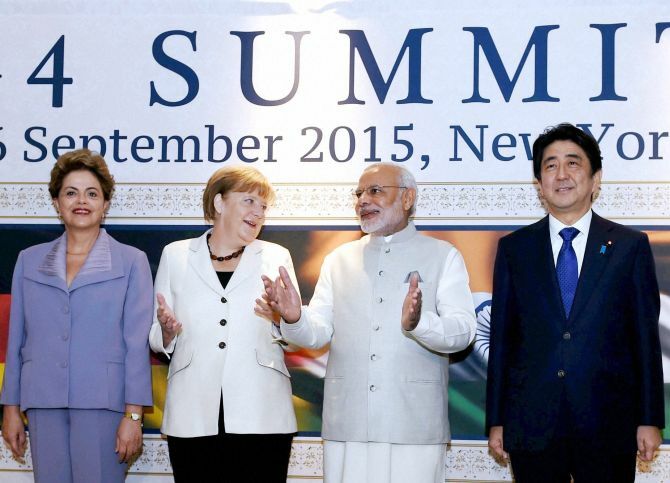 Threats to peace and security have become more complex, unpredictable and undefined,” Modi said. He referred to the recent decision of the UNGA to commence text-based negotiations on UN reforms and said, “after decades, we finally see some movement. The 69th Session of the General Assembly has taken a significant step forward”. In her remarks, Merkel said the G-4 was not any “exclusive group” and it believes in taking others also along in its pursuit of ensuring reform of the UNSC. Abe, while terming the meeting as a “golden opportunity”, said there was a “mounting momentum for change” and “voices of great nations should be heard”. Rousseff also underlined the need for urgent reform of the world body. The joint statement said the leaders welcomed the adoption by consensus of the General Assembly decision to use the text presented by the president of the 69th General Assembly in his letter dated July 31, 2015 as the basis for negotiations within the IGN (Inter-governmental negotiations). “They also pledged to support and cooperate with the president of the 70th General Assembly,” it said. The leaders also noted with appreciation the efforts of member states in moving towards text-based negotiations. 10 things the UN needs to do NOW!